By simulating conditions in space, scientists in France say they found ribose — the ‘R’ in RNA — is potentially present throughout the universe. A team of researchers at the Institut de Chime de Nice (CNRS) in Paris have just published a study that goes a long way to the pseudo-panspermia perspective. In the newest issue of Science, the researchers suggest that ribose — a key sugar found in the genetic material of all organism — might be formed on ices within comets. Ribose is a key part of nucleic acids like DNA and RNA. The formation of such a compound on a comet would indicate that the fundamental ingredients for life aren’t simply capable of traveling across interstellar space to different worlds, but can also form in space. We’ve already found amino acids on comets, cosmic dust laced with complex organic matter, and basic sugars in other star systems. The Ribose finding would amount to more evidence stacking up. To be clear, the scientists haven’t actually found ribose on a comet. Instead, they’ve used data gathered by other scientists to artificially simulate the evolution of interstellar comet ice under astrophysical conditions in a lab, and were able to derive ribose as a result. 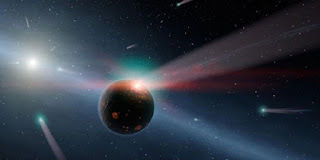 The artificial comet, produced at the Institut d’ Astorphysique Spatiale, was made by mixing water, methanol, and ammonia in a high vacuum chamber at minus 200 degrees Celsius. The researchers added dust grains with ice that act as the raw material of comets, and irradiated the whole thing with ultraviolet light. When the sample was heated to room temperature — as a comet would be as it approaches the sun — it was found to have developed simple sugars. We still have to wait to confirm whether ribose can actually be formed on a real comet, but the implications of this new discovery are nevertheless huge. The more we learn about what kinds of compounds are laying low within asteroids and comets, the more support panspermia-type theories obtain. Perhaps life really did come to Earth on a comet. And perhaps we could send life to other worlds by sticking some organic compounds on our own artificial comet and firing it off into the depths of the universe.